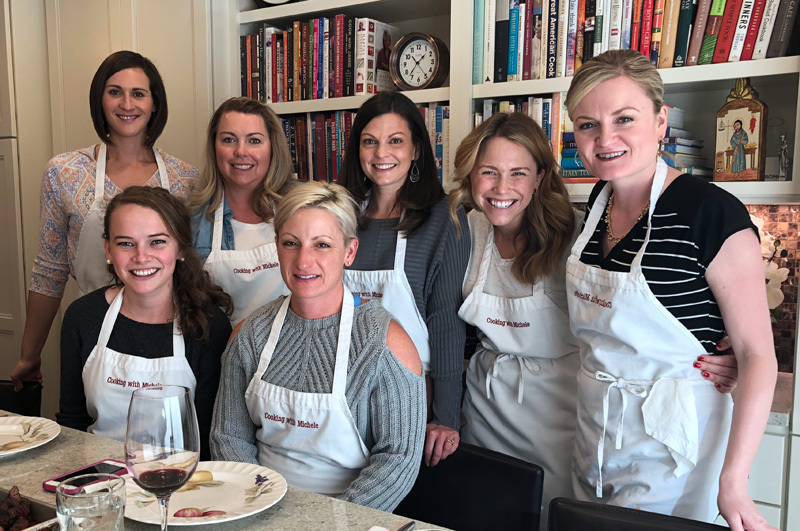 Late last year this lovely group of women asked if I could create a cooking class for them focused on game meats. 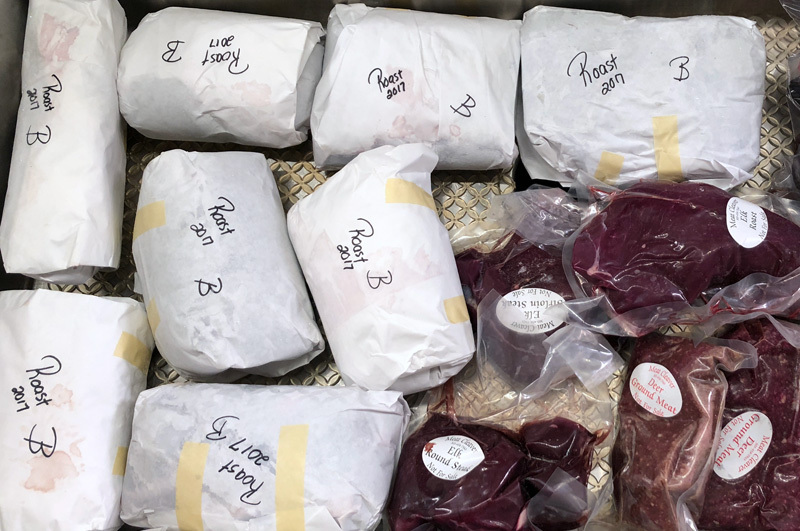 All of their husbands are hunters, and many of them found themselves with far too much venison, elk, and pheasant in the freezer than they knew what to do with. Moreover, they needed some tips on dealing with game meats which are far leaner than commercially raised beef or chicken. It took me a bit to figure out how to approach this since I knew some recipes would require low and slow cooking techniques to achieve the desired results, and in the end, I came up with a plan of two slow cooking recipes and two fast cooking. The first slow cooking recipe was the Smoked Pheasant Soup from my Tasting Colorado Cookbook. The pheasant needs to simmer for a few hours to create the rich stock that is the base for the soup, so I did that ahead of time, then the women finished the soup in class. 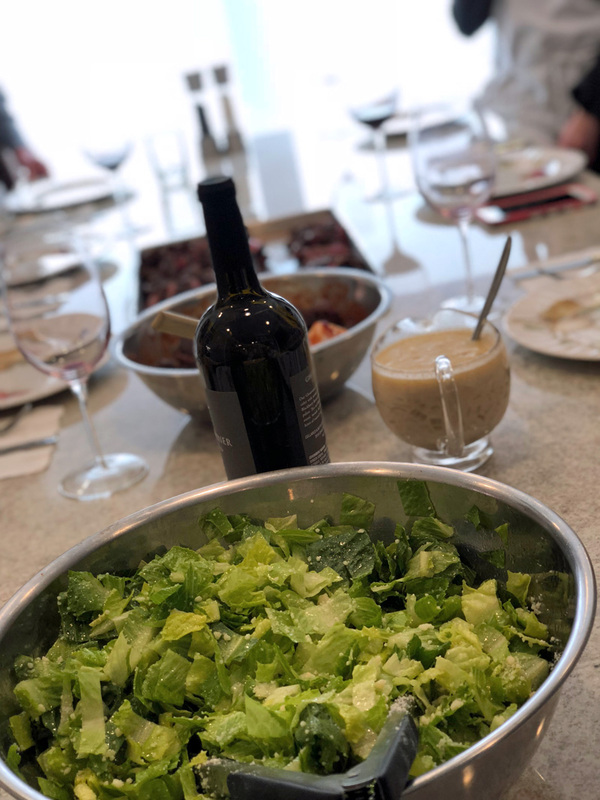 (Tip: that recipe uses A LOT of heavy cream – we tasted it without the cream and with and the group was mixed on which they preferred. You can always adjust that to your preference and dietary needs!) The women had a bunch of roasts (wrapped in butcher paper) that would require a long braise to tenderize, so I adapted my easy Beef Bourgogne recipe to use these venison roasts. We prepped the braising liquid in class and prepared the mushrooms and onions to add at the end, then they took everything home in their own Dutch ovens to finish at home. The other meat you see in the sink above are elk steaks, perfect for slow cooking. We seasoned them with my Porcini Dry Rub, then quickly grilled them (you can’t cook lean game meats past medium rare and expect them to be tender! ), let them rest, and served them with a Whisky Cream Sauce (in the pitcher on the island in the photo above). 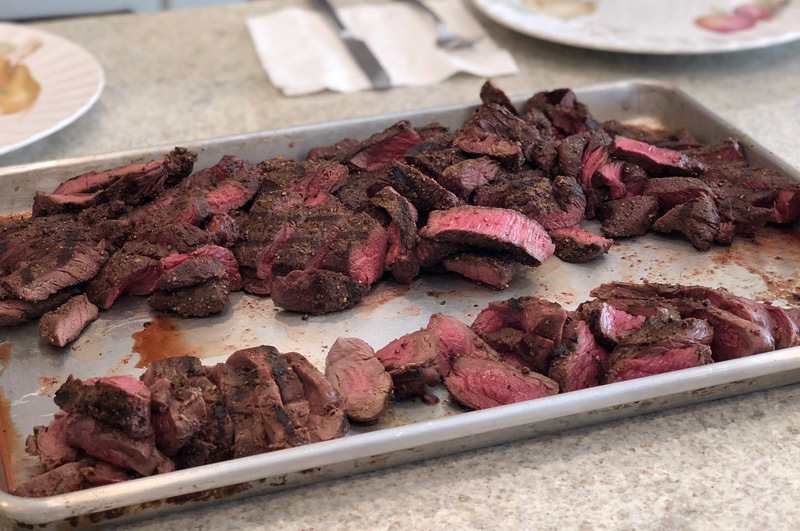 We also grilled venison tenderloins, and while some of the women aren’t usually crazy about venison, everyone agreed it was much better with the rub and the sauce! 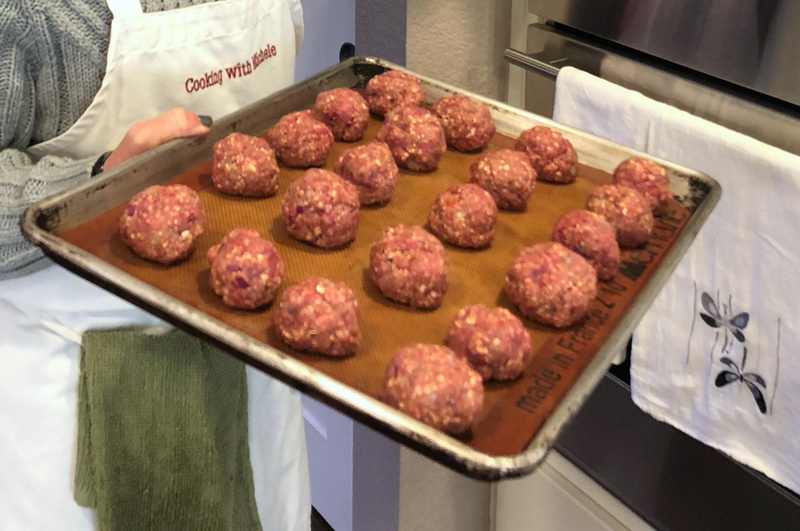 My favorite recipe from the day were these Venison Meatballs. I made them just like I do other cocktail meatballs, baking them in the oven first… …and then gently tossing them with a glaze. The fruity sauce offset the gaminess of the venison and many in the group couldn’t really even tell it was venison. I don’t usually like venison at all, but loved these, especially the kick from the jalapeño in the sauce. I you don’t have game meat on hand you can certainly make these meatballs using another meat! 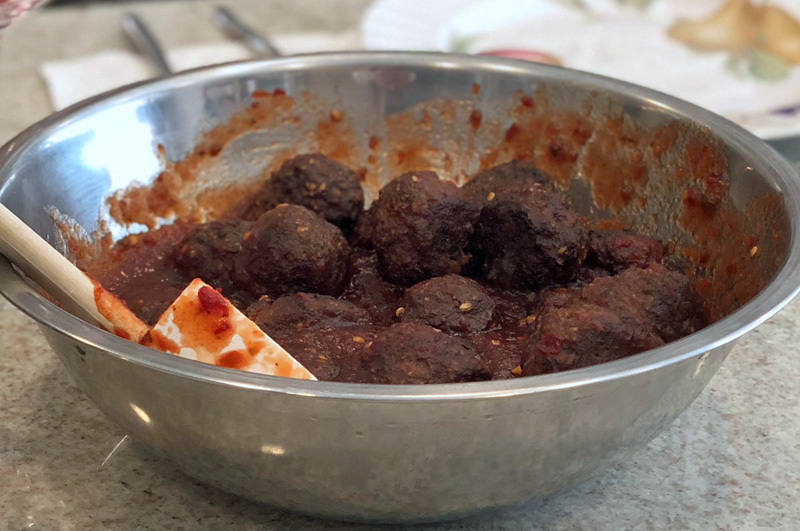 Combine all of the ingredients for the meatballs in a large bowl and use a fork to mix together, taking care not to overwork the meat. Portion with a scoop onto a baking sheet and bake at 375 degrees until cooked through, about 15-20 minutes. While the meatballs are cooking, combine the ingredients for the sauce in a medium saucepan over medium high heat. Bring to a boil, then reduce and simmer, uncovered, until all of the ingredients meld, about 15 minutes, stirring frequently. Toss cooked meatballs with the sauce and serve warm.